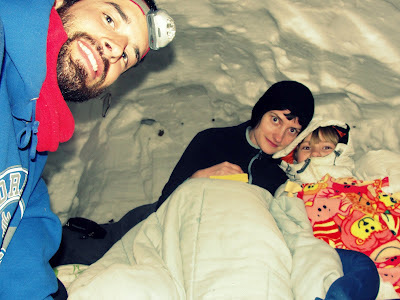 Think back to the time when you could spend a day carving out a snowbank, creating the perfect secret hideout. It can be easy to forget the simple pleasure of hollowing a snowbank in the midst of daily stress. The act of spending a day or even a few hours playing outside can leave you feeling refreshed with a sense of accomplishment. 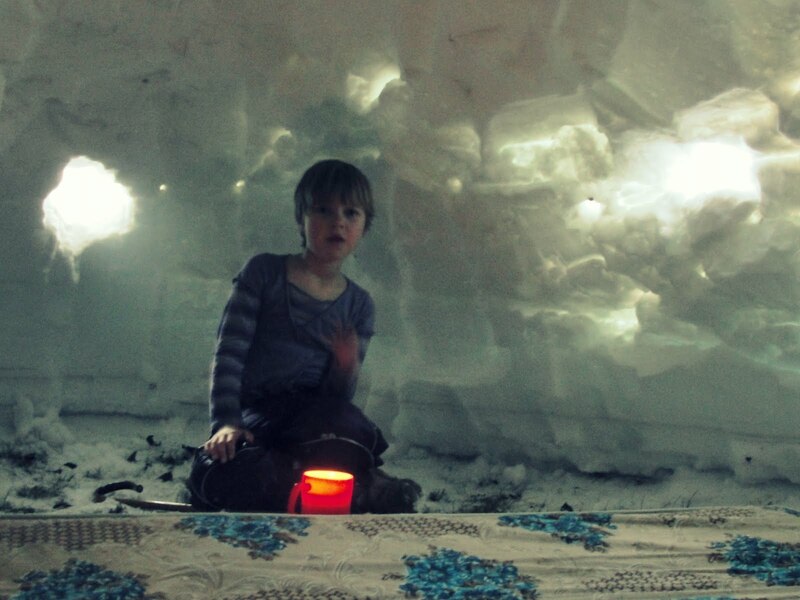 For winter campers, that hollowed out snowbank has a name - Quinzhee or Quinzee. It's main purpose is an emergency shelter, however it's not the only purpose. The quinzhee can be a creative outlet, a workout and a bonding moment as I discovered the other day. Here is how to get started. 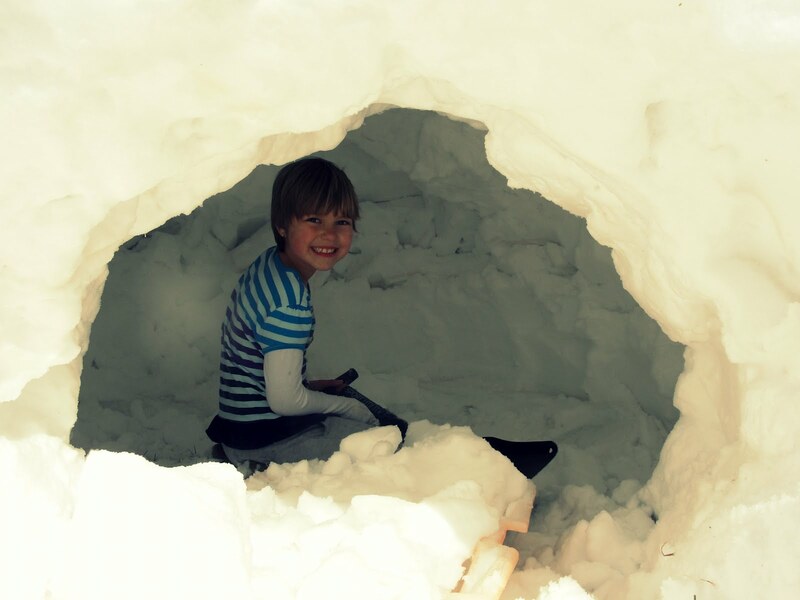 Find a place to build your quinzhee, a flat backyard or wooded lot that has an abundance of snow is ideal. 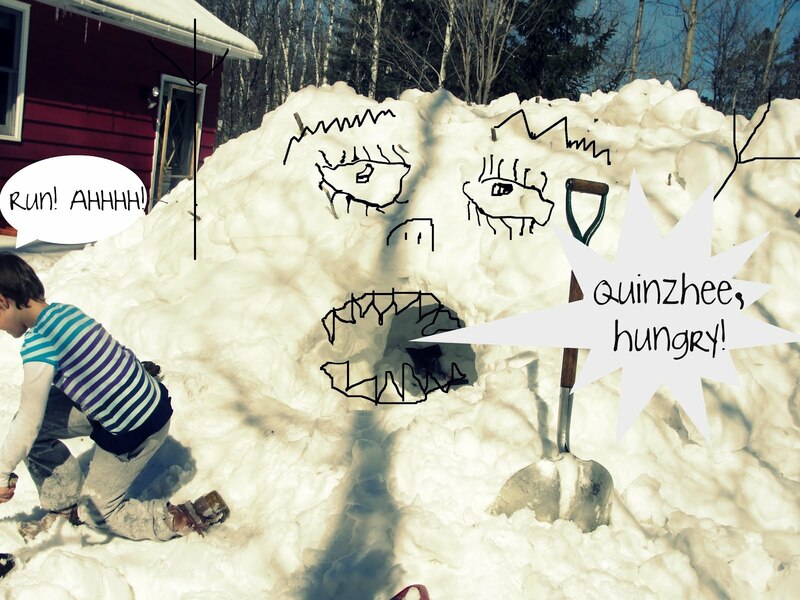 In determining the size of your quinzhee, take into consideration- available time, snow and number of helpers. Start by walking the approximate perimeter of the quinzhee to find the center point. Next, tramp down the snow inside the perimeter, this will make a solid foundation. Shovel snow from outside the perimeter to the center point, be sure not to pack the snow. The small air pockets will insulate the walls. As a reference, a large quinzhee will have a snow pile height of 6-10 feet, this can take anywhere from 1-2 hours depending on available help and snow conditions. When the pile has reached its desired height, take a 3-8 hour break, this will allow the snow to settle and strengthen. 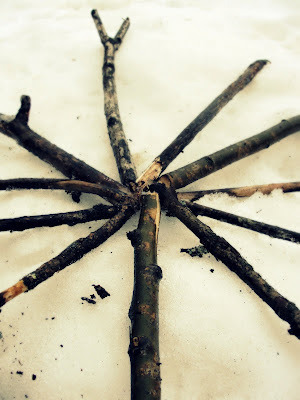 After taking a well deserved break, collect 20 dead sticks that have about the diameter of your finger and are 12 inches long. 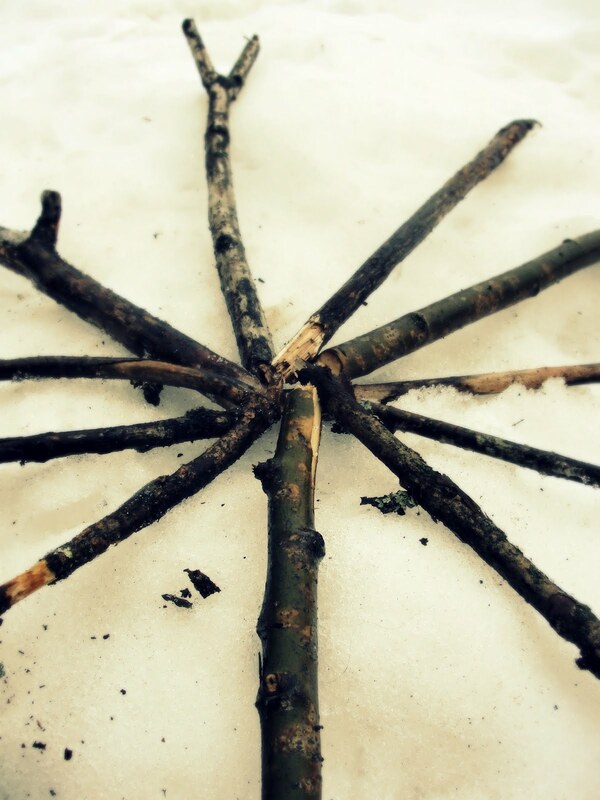 Push the sticks into the pile of snow spacing them throughout walls and roof. This will ensure that when excavating the wall will not get too thin. Determine where to put the opening. The size should allow you to crawl through comfortably. 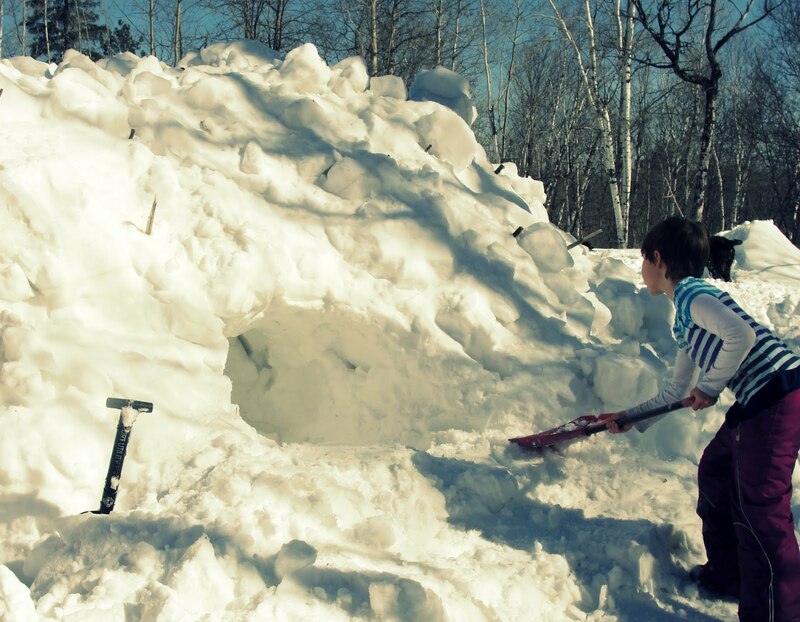 Use a small to medium shovel to excavate the pile of snow starting at the door. When you have reached a stick stop digging at that spot. Continue shaping and removing snow until the interior walls have exposed the tip of the sticks previously pushed into the snow or until the exterior light shines through the walls. Shoveling snow out of the small door can be difficult, we found it easier to fill a sled and push it out the door to be dumped. When the excavation is complete put 2-3 air holes 3-4 inches in diameter in the ceiling to allow for proper ventilation. Put a burning candle in the quinzhee for 15-30 minutes to melt the interior wall, remove the candle, and allow it to refreeze. Now it's time to move in! Should you decide to spend the night, create a fabric door to prevent warm air from escaping. Lay a tarp on the floor. Cushioning the sleep area with a mat will help conserve body heat. Burn 1-2 unscented candles (carefully in the corner) for heat. Your body heat will also warm the space. - Have some fun decorating your quinzhee. 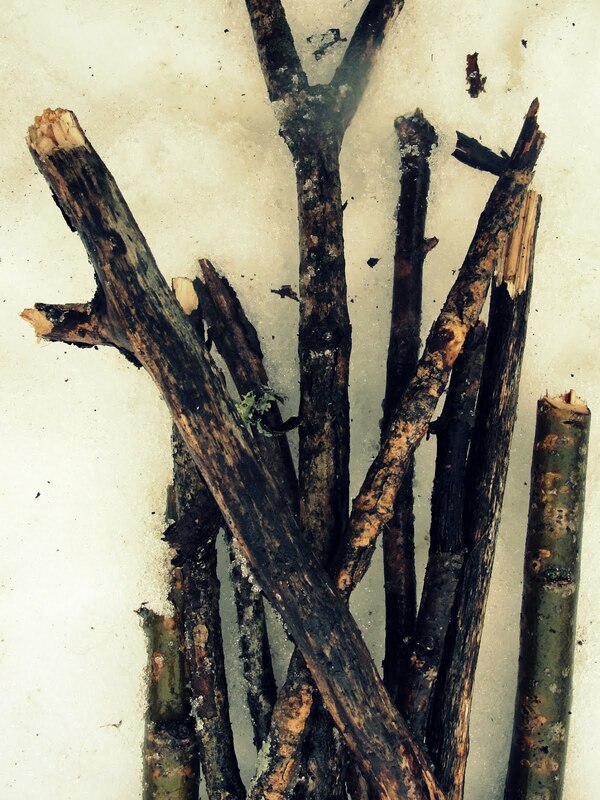 - Use dead sticks and other collected objects to give your quinzhee a personality. - Put food coloring mixed with water into a spray bottle to add color inside or outside. - Pretend to be in a far away land, or in the belly of a quinzhee monster. Use caution when building a quinzhee as they can collapse. - While excavating, dig on your knees to allow easier escape should a collapse occur. - Only use candles for heat. All other heat sources will create carbon dioxide build up. 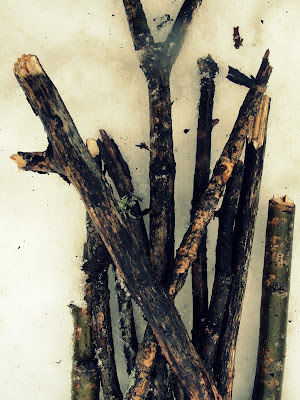 - Plan on wearing multiple layers, so you have layers to shed. You may sweat or get wet from melting snow.